This time of year, especially Halloween makes me ache for my childhood. I can remember so vividly how excited I was going to school on Halloween for the costume parade and the classroom Halloween party. But I also couldn’t get home quick enough to prepare for the evening. Halloween was a big deal at our house and all I wanted to do was get home from school and help my dad to be a part of it. So it’s no surprise that my expectations for providing a fun-filled Halloween were high as Ellie was getting older. And with these high expectations, I sometimes forget that Ellie is only three and Chloe’s only one. First off, I had to make their costumes. That’s the whole reason I learned how to sew. I had to make them. 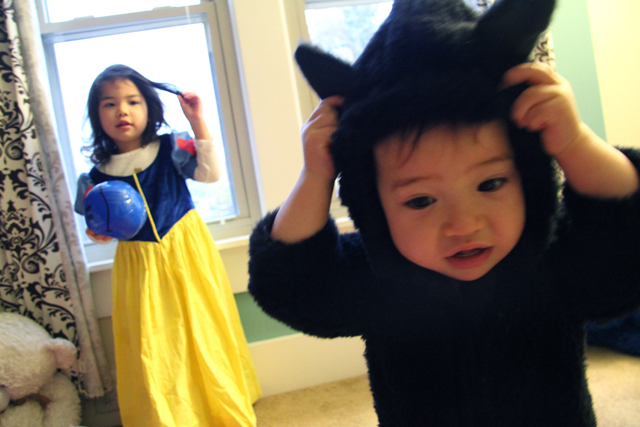 The original plan was that Ellie was going to be the witch Kiki (From the Hayao Miyazaki movie Kiki’s Delivery Service) and Chloe was going to be her black cat, Jiji. It was going to be adorbs. 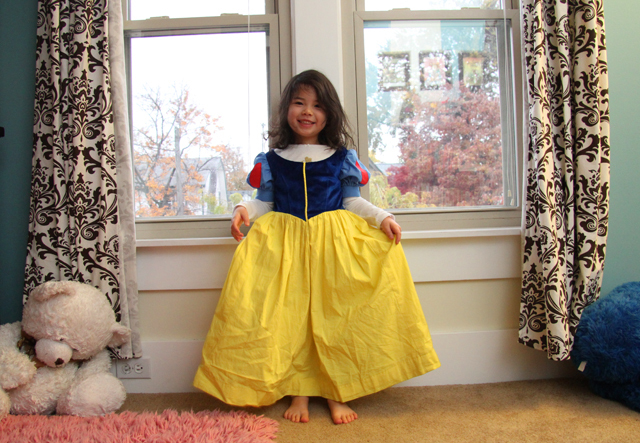 But as a toilet training negotiating tactic, Ellie was offered the opportunity to be Snow White which she eventually accepted (Yes, that means I’m now a proud father of a mostly toilet trained kid, but that’s a whooooole other story). So even though I made her Kiki costume, she wasn’t going to wear it. 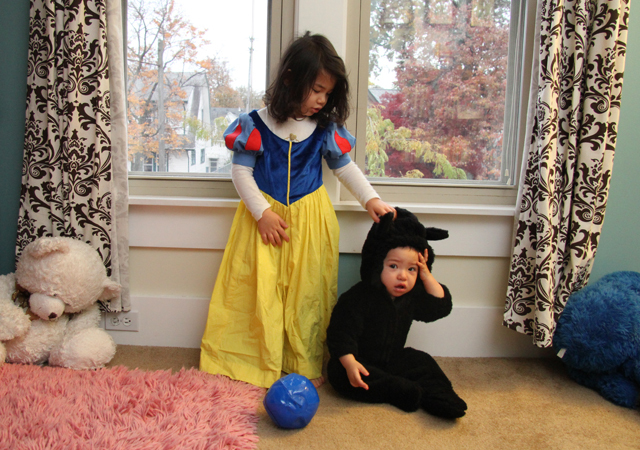 I was slightly bummed but was focusing on the big picture (If Snow White didn’t work as a toilet training bribery, I was ready to give her my car). 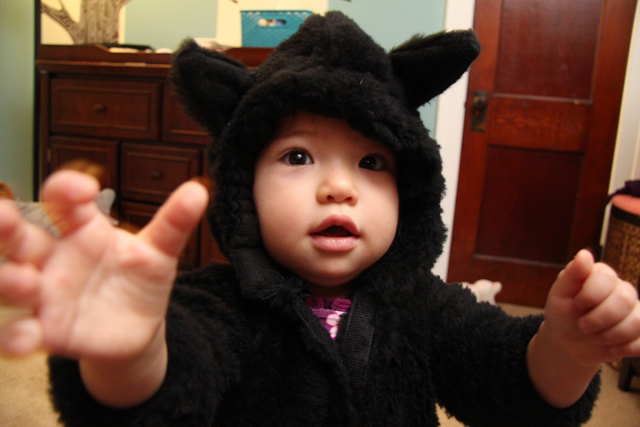 At least I could still make Chloe’s Jiji costume which I finally finished at 2 am the morning of Halloween (even though she looked more like a bear and less like a cat). All we had to do was go trick or treating to have the best Halloween ever! Right? I had the Halloween tunes kickin’on the stereo, a big pot of pumpkin chili simmering, and my mom and dad came over with a homemade pumpkin roll. It was cold and rainy but all we had to do was walk down the street and back. Ellie was super excited in her Snow White dress and was constantly spinning, holding her pumpkin bucket. “Let’s go let’s go!” After I finally wrestled Chloe into her cat costume and strapped her into the stroller, watch out, Trick or treat here we come! “You don’t want any candy?” I asked. 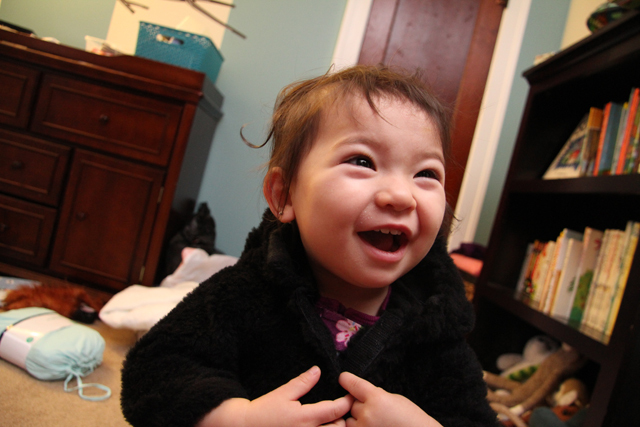 My mom offered, my dad offered, Aya offered, we presented her with other options but all she wanted to do was go home. I think it was a combination of the dreary evening and not wanting to walk up the steps in her long dress. It was just too much for her. After some begging and pleading I did manage to get a few photos of them… four days later. As my friend suggested, maybe next year they will both be simple ghosts. I was right there with you. I croched mommy and me cabbage patch wig/hats for Lily and I and I put in my footie pajamas (shudder) and put her snowsuit clad self in the Mei Tai. JB dressed.as Darth Vader and a couole friends of ours came with their daughter Tinkerbell. About fifteen minutes in Tinkerbell decided to call it quits. Five minutes after that cabbage patch number one fell asleep in the Mei Tai and twenty minutes after that Darth Vader decided he was too tired to walk and Daddy had to carry all 45 lbs of him all the way back to Nana and Papas house. Our Trick or Treat got moved to Sunday though, so at least we didn’t have the rain. Darth Vader too tired to walk?! Where was the force when you needed it? What an adventure you had. At least you didn’t have the rain. There’s always next year, right?